The Chamber of Deputies (Spanish: Cámara de Diputados) is the lower house of the Congress of the Union, the bicameral legislature of Mexico. The other chamber is the Senate. The structure and responsibilities of both chambers of Congress are defined in Articles 50 to 70 of the current constitution. The Chamber of Deputies is composed of one federal representative (in Spanish: diputado federal) for every 200,000 citizens. The Chamber has 500 members, elected using the parallel voting system. Of these, 300 "majority deputies" are directly elected by plurality from single-member districts, the federal electoral districts. The remaining 200 "party deputies" are assigned through rules of proportional representation. These seats are not tied to districts; rather, they are allocated to parties based on each party's share of the national vote. The 200 party deputies are intended to counterbalance the sectional interests of the district-based representatives. Substitutes are elected at the same time as each deputy, so special elections are rare. The federal electoral districts of Mexico are the 300 constituencies or electoral districts into which Mexico is divided for the purpose of federal elections. Each district returns one federal deputy (diputado), who sits in the Chamber of Deputies, the lower house of the Federal Congress. An additional 200 deputies are elected by proportional representation from the five electoral regions. From 1917 to 2015, deputies were barred from serving consecutive terms in accordance with the Constitution's ban on immediate re-election to the legislature. Thus, the Chamber of Deputies was one of the few legislative bodies in the world that was completely renewed at an election. However, this will change at the 2018 elections; deputies are now permitted to run for re-election. Congressional elections held halfway into the president's six-year mandate are known as mid-term elections. 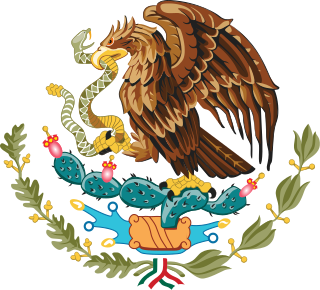 The Declaration of Independence of the Mexican Empire is the document by which the Mexican Empire declared independence from the Spanish Empire. 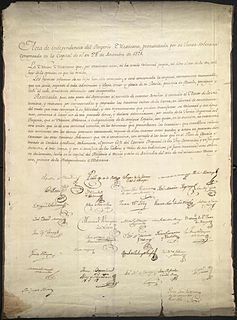 This founding document of the Mexican nation was drafted in the National Palace in Mexico City on September 28, 1821, by Juan José Espinosa de los Monteros, secretary of the Provisional Governmental Board. The Congress of Deputies is the lower house of the Cortes Generales, Spain's legislative branch. It is located in the Palace of the Parliament. 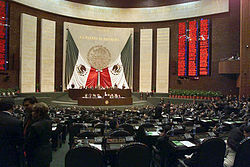 The Senate of the Republic, constitutionally Chamber of Senators of the Honorable Congress of the Union, is the upper house of Mexico's bicameral Congress. The National Assembly is the de jure legislature for Venezuela that was first elected in 2000. The National Assembly has been rendered ceremonial since the introduction of the Constituent Assembly in 2017. It is a unicameral body made up of a variable number of members, who were elected by a "universal, direct, personal, and secret" vote partly by direct election in state-based voting districts, and partly on a state-based party-list proportional representation system. The number of seats is constant, each state and the Capital district elected three representatives plus the result of dividing the state population by 1.1% of the total population of the country. Three seats are reserved for representatives of Venezuela's indigenous peoples and elected separately by all citizens, not just those with indigenous backgrounds. For the 2010-2015 period the number of seats was 165. All deputies serve five-year terms. The National Assembly meets in the Federal Legislative Palace in Venezuela's capital, Caracas. The Chamber of Deputies is the lower chamber of the Congress which, along with the Senate, composes the legislature of the Dominican Republic. The Honourable Chamber of Deputies of the Republic of Chile is the lower house of Chile's bicameral Congress. Its organisation and its powers and duties are defined in articles 42 to 59 of Chile's current constitution. The Chamber of Deputies is the lower house of the Argentine National Congress. It is made up of 257 national deputies who are elected in multi-member constituencies corresponding with the territories of the 23 provinces of Argentina by party list proportional representation. Elections to the Chamber are held every two years; half of its members are renewed each election. The Chamber of Deputies is a federal legislative body and the lower house of the National Congress of Brazil. The chamber comprises 513 deputies, who are elected by proportional representation to serve four-year terms. The current President of the Chamber is the deputy Rodrigo Maia (DEM-RJ), who was elected in July 14, 2016 to serve for the remainder of the 2015–2016 term. The President of the Congress of Deputies is the speaker of the Congress of Deputies, the lower house of Spain's Cortes Generales. 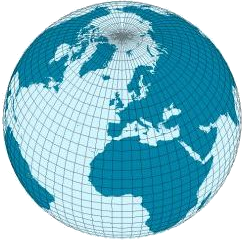 The current office was established in 1978 by Article 72, Section 2 of the Spanish Constitution, which states in part, "The Chambers shall choose their respective Presidents...". However, the position has a tradition of more than 200 years, since its creation in 1810 as President of the Cortes of Cadiz. The President of the Senate of Spain is the speaker of the Spanish Senate, the upper house of Spain's Cortes Generales. The current office was established in 1978 by Article 72, Section 2 of the Spanish Constitution, which states in part, "The Houses shall choose their respective Presidents...". However, the position has a tradition of almost 200 years, since its creation in 1834. Roberto Gil Zuarth is a Mexican politician affiliated with the PAN. He was Undersecretary of the Interior. He also served as Deputy between 2009 and 2011 during the 61st Legislature. He contended in 2010 for the presidency of the National Action Party against Gustavo Madero Muñoz. He was Private Secretary to Mexican President Felipe Calderón. He currently serves as Senator of the LXIII Legislature of the Mexican Congress. Since September 1, 2015 he is the President of the Mexican Senate. The history of the Costa Rican legislature is long and starts from even before its formal independence from the Spanish Empire. Costa Rica is one of the world's oldest democracies, thus, its parliamentary history dates back several centuries. ↑ "Celebra SEGOB los 187 años de la firma del acta de Independencia". Presidencia de la Republica. Retrieved March 24, 2014.